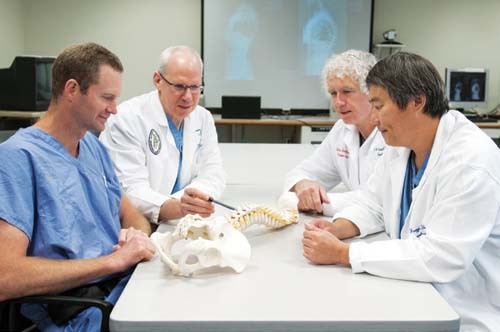 The UW Medicine Spine Center represents state-of-the-art clinical care, teaching and research, bringing together an array of board certified specialists to provide a cost effective, multidisciplinary approach to spine care. A team of physicians work hand-in-hand to evaluate each patient and decide the best course of treatment. Patients will be assessed, triaged and treated by the most appropriate healthcare professionals. Treatments may include diagnostic and minimally invasive procedures, as well as the most technologically advanced surgical interventions. We provide personalized, expert care for patients with both simple and complex spine disorders and diseases. You may make your own appointment at the Spine Center or you may be referred by your physician. To make an appointment, please call: 206-520-5000 or Toll Free 877-520-5000.